Life isn't always easy. Sometimes you feel frustrated, stressed, lonely and unmotivated. Some days, all you need is a good night sleep. But what to do when sleep doesn't make it better? What if you still feel blah? What is Life Coaching with Horses, and Who is it For? Life coaching is a way to tap into your full potential, and find inside of yourself a source of acceleration to become the best version of yourself. Life coaching with horses takes life coaching out of the office, into nature, to stop talking and begin feeling, sensing, playing and enjoying. Life coaching is a partnership, between you, me and the horses, and together we identify solutions to pesky roadblocks in your life. 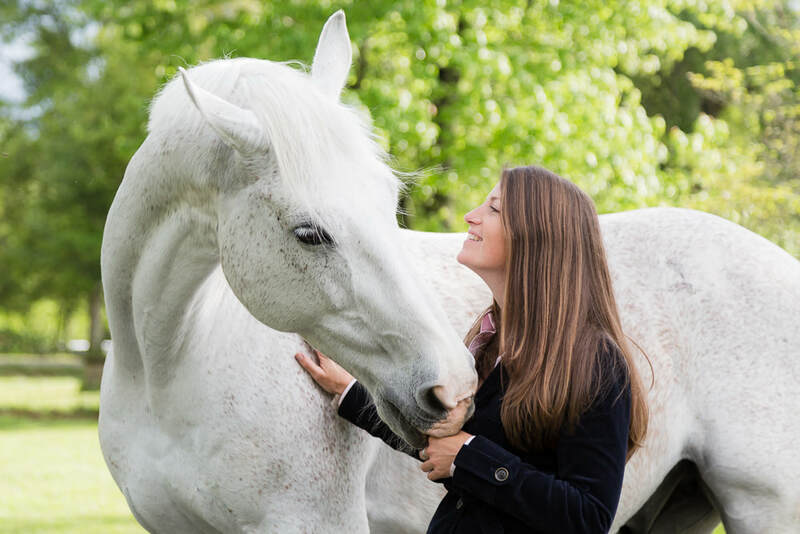 The EquineFlow Coaching approach is a proven, stimulating, soul-stirring, certified, transformational approach backed by cognitive neuro science, narrative coaching, positive psychology and horse assisted learning, designed specifically to help smart, forward thinkers clear what stands in the way so they can get what they want from life. It was developed by uniting the LifeSight Transformational Coaching model, which includes over 30 therapeutic modalities, developed by Dr. Greyerbiehl PhD with Dr. Dan Siegel's Mindsight work, EAGALA, Natural Lifemanship, Applied Ethology, and proven performance optimization methodologies from the corporate consultancy world, such as Mindmapping, DMAIC Six sigma, Deming, PRINCE II, Kaizen, COCD Box, Ikigai and 5Whys. ​I can think more clearly and find I can trust in my decision making processes as a result. 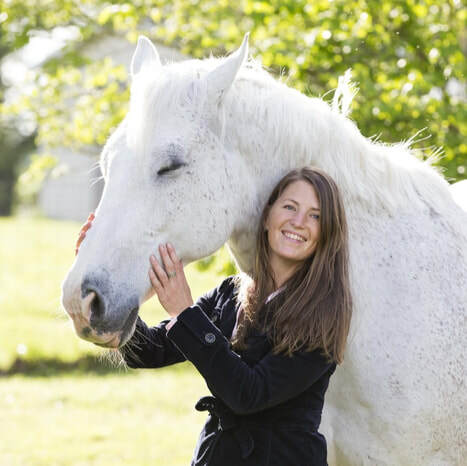 EquineFlow Coaching has helped me in all areas of my life, relationships, parenting and my work as the founder of a non-profit charity. I can not recommend Equineflow and Monique more highly. Karen E. Greenville, SC. How Does EquineFlow Coaching Transform Your life? Over the course of 16 weeks you'll focus on expanding your sense of self, during private, one-on-one sessions lasting 60 to 90 minutes. You learn how to leverage mind , body and heart to bring enjoyment and meaning back into life. You discover brain-based techniques to expand self-determination, self-trust and self-direction. Experiential (meaning involving or based on experience and observation) in nature, you learn how to stop relying on other people for approval and instead discover your own answers, truths and place in the world. Think of it like personal training at the Gym, but instead of growing a six-pack, you radically amplify strength, agility and influence of your mind, to maximize happiness and achieve your version of success. We discover where you are now, what your strengths are, your passions, skills and values, and get clarity on what you want from life. You may want financial freedom, more happiness, assertiveness, confidence, healthier relationships, more influence on your community or perhaps simply expand the feeling of gratitude for what you have in life, and learn to be more present in the moment. Whatever you are after, we get clarity on what coaching should achieve for you. We identify and clear what stands in your way of happiness. With you firmly in the lead of the process, we keep working together to anchor newfound insights, abilities and skills, linking them and integrating them as we go. We celebrate, looking back at an incredible journey, you'll be glad you started with that single step. This is the #1 thing clients say after completing their EquineFlow coaching journey; "I wish I had done this years ago, so I knew back then, what I know now." The Equineflow Coaching Approach includes a wide variety of proven modalities. This means you are never stuck with a program that doesn't suit you; if you don't like a modality, we exchange it for another one that suits you better. Whatever the modality, you can rest assured it is time tested, science-backed and proven. Dr. Greyerbiehl PhD took a life time worth of experiences in her career as a cognitive neuroscientist, counselor, professor and speech therapist, and used it to develop the Life Sight transformational approach. It includes CBT, NLP, Mindsight, Felt Sense, Intuition work, Mindfulness, Art Coaching, Play Coaching, Hypnosis, Tapping, Narrative Coaching and more, and the EquineFlow approach draws heavily from it. Working with Monique has been simultaneously one of the easiest and most challenging experiences I have ever had. Most importantly, it has been extremely rewarding. Monique is skilled at unapologetically pushing you to work hard, while showing incredible empathy and developing lasting rapport with you from the very first session. Honestly, I was a bit skeptical of life-coaching in the beginning because I am trained as a therapist, however what EquineFlow offered really sounded like exactly what I needed at this point in my life. Monique’s methods are based in research and she is always willing to explain the neuroscience behind what she is doing. What's the Deal with the Horses? The Coaching process is complimented by employing horse guided learning. Horse Guided Learning is an experiential learning approach that helps you deepen your embodied intuition, and unlock cognitive intelligence through minimally structured play with unbridled horses. Horses have survived thousands of years without ever having to fall back on using words. They are the masters of authentic, what-you-see-is-what-you-get, non-verbal communication. By tuning into non-verbal communication you sharpen your ability to pick up on subtle clues in behavior, both in your own and in behavior of others. If you think it, they feel it, and if they feel it, they express it. Horses pick up on the smallest, lightest changes in their environment and do not have agendas. They are in the moment, responding to the intent within. This helps you understand what you radiate, when you radiate, and identify whether this is productive. Horses are fun, mischievous, exciting. They add unique, unprecedented elements in a way that makes you think twice, laugh and anchor new insights easier. By staying in the flow of the activity with the horses, you remain fully immersed in a feeling of energized focus, full involvement, and enjoyment, recharging your battery for the busy week ahead. The work with horses can be deeply relaxing or deeply confronting. Their clean responses help you calibrate your mind, sharpen your intuition and build healthy connections both with others, and with yourself. The process teaches you the importance of self-trust, self-determination and self-direction, and promotes your ability to follow intuition, and do what you know is right for you. You decide how much you want to work with the horses. You decide which horses you work with and how long. You decide on what activity you'd prefer. I provide a minimal, science backed structure to help you jump start learning and then withdraw to the side line. I only occasionally step in to check in with both you and the horses, and can help you reflect afterward. You are in the lead of your own experience and your own progress. Some want all sessions to be with the horses while international clients usually meet online and do not participate in any of the sessions with horses. Either way the program delivers results. Before starting working with Monique, I had a huge weight on my shoulders. Now I have a different picture of what my future looks like. Every session was like a small awakening and when I came closer to my turning point, I almost felt an overwhelming sense of bliss, understanding and peace. I had all the tools and knowledge all along. It just took the right person to ask the right questions. If you feel stuck or uncomfortable, if you don’t know why or lack the skills to achieve your dreams, I highly recommend working with Monique. She’s a highly analytical, thoughtful and caring coach that will show you many opportunities to practice joy and happiness." Who feel like something isn't all the way right with their life. Something is missing, but it's not all the way clear what, or if it is clear, what to do about it. In need of a change? Not feeling like regular therapy / counseling is the right match for you? ​Looking for a healthy, vibrant life without gimmicks or quick fixes? EquineFlow Coaching sessions are private, and last 65 to 90 minutes. ​How often should we see each other? Weekly or bi-weekly sessions for 13 to 16 weeks give the best results for true transformations. For specific challenges in targeted areas of your life, 4 to 6 weeks are also a good fit. Single sessions are good for if you just want to give it a try, or if you just want to come play with the horses. Most clients stay on for once a month sessions after their initial 16 week plan. Where are you located? Do you offer online Coaching? Do you speak any other languages? We are located on a private horse farm in Greenville, SC. I offer online training through Skype or Go-To Meeting. I am fluent in English and Dutch and can train in both languages. Will I ever ride the horses? While 99% of our work with the horses is best done on the ground, one of the elements of the Equineflow approach is Rhythmic Riding, developed by Natural Lifemanship. This modality is focused on promoting mind regulation, and uses music and cross body exercises to achieve balanced thinking. This may be included in your session. You may also book a single Rhythmic Riding session as a stand alone session. How do I schedule my first session? Click on the button below to send a message. You will be contacted within 24 hours to set up a call to answer any questions you may have, and to schedule your first appointment. Let the real you shine. Live Your Best Life Ever.